It is a new year and with the new year comes New Year’s resolutions. Many of us set goals for our health and we start new exercise plans and determine to be more healthy than the year before. Many people set family goals and one of our family goals is to be more active in general. 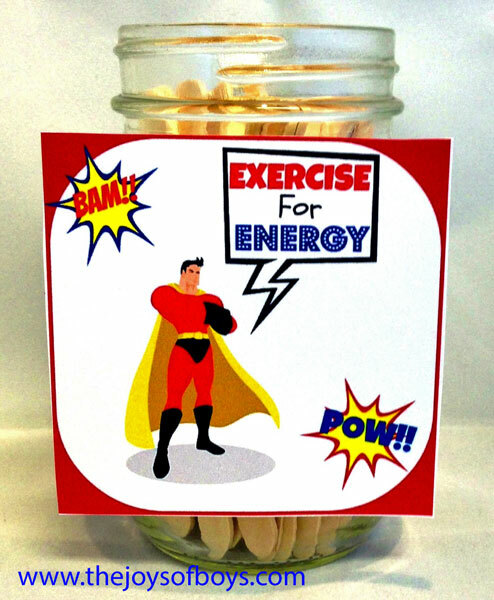 I came up with this “Exercise for Energy” jar filled with fun exercises for kids that my boys helped me come up with to help keep us active when we are stuck in the house. It can be hard to keep kids active inside when the weather outside isn’t cooperating. Here in the desert, it is beautiful right now and we play outside as much as possible, but come summertime I know we’ll be confined to the house. And many of you are stuck in the house due to snow and cold weather. This is a perfect way to keep your kids active and healthy without it feeling like exercise. So how does it work? Take several popsicle sticks and write different exercises on them and keep them in a mason jar or other container. Any time your kids are stuck in the video game groove or even if they have too much energy and need a safe way to burn it off, have them pull out a few sticks and do the exercises on them. I like to crank up some music and make it fun. And of course we don’t want to ask them to exercise if we’re not willing to do it ourselves, so make this a family activity and do it with them. We added some normal exercises like jumping jacks and then got creative and added in some exercises for kids like the “Ironman”, where you lay on your stomach and put your arms and legs behind you in the air like you are flying, and the “Superman” which is the same as the Ironman except arms are in the front. My boys also came up with “The Hulk” which is bicep curls with some light weights and “Dance Party”, where they crank up the music and just dance. I tried to keep this more fun than anything and kept the focus on “Exercise for Energy”, so that they would have the energy they need to do the other fun things they want to do throughout the day. And I love that the whole family can get involved. 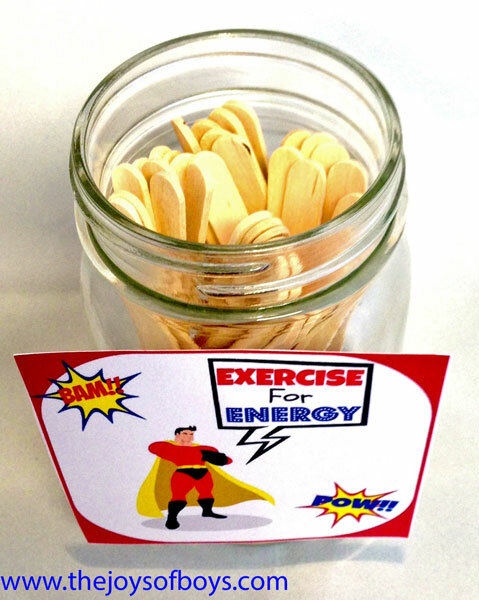 You can print out the label here: Exercise for Energy. What fun things do you do to keep your kids active when you are stuck in the house? I love this idea! My boys and Hubby did exercise stations indoors and the boys loved it, but never thought of Super Hero exercises! that’s brilliant! 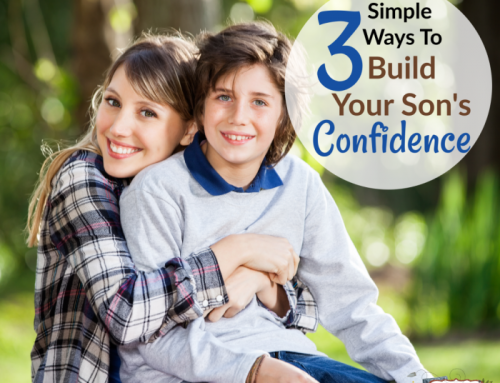 Great suggestions – as a mom who also has boys, I do appreciate the super hero twist to this activity. My boys had a lot of fun coming up with their own “Superhero” exercises to include in the jar. They used this nearly every day when they needed to burn off some energy. We have three boys and a girl (all 5 years old). These suggestions will be great to keep them active and moving and having fun!